Has it really been a year since Finding Father Christmas? Well, no, since I just watched it earlier this evening and am now rounding out my double feature with its sequel, Engaging Father Christmas. How things have changed in the time it took for me to switch from one title to the next. 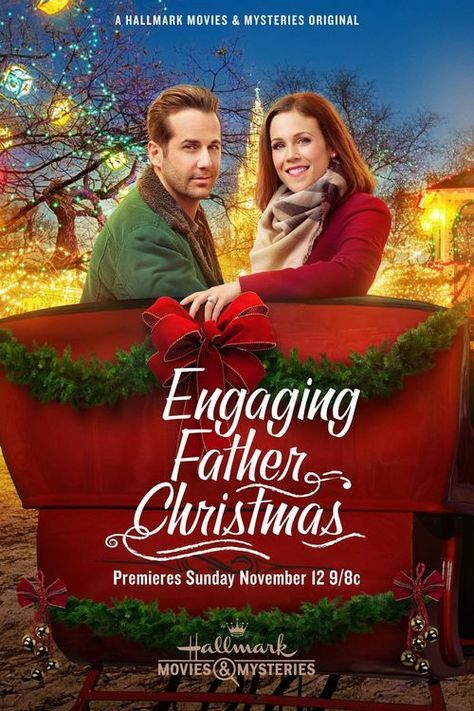 When we first met Miranda (Erin Krakow), she was a dispirited young woman who didn’t care for Christmas and didn’t have family to spend it with anyway. Now she’s tossing out gifts left and right, stuffing her suitcase with ice skates and wooly sweaters, and flying off to Vermont to see her wood-chopping boyfriend, Ian (Niall Matter), and her new family. What a satisfying feeling for all of us to revisit old TV friends together. The drama didn’t end when Miranda discovered the identity of her father, a famous actor named James Whitcomb who had already had a family of his own. She’s spent the past year keeping the secret in order to protect his wife, his son, and his reputation, but that proves to be too long. En route to Carlton Heath, Vermont, she meets her ex, Josh (Andrew Francis, who seems to be in every Hallmark movie lately), and proceeds to spill the beans, all of them. It’s kind of difficult to watch because on the one hand, she’s excited to finally share her joy with someone else. But she also cares a lot about the Whitcombs and doesn’t want to jeopardize her relationship with them. You can see fear seize her as she repeatedly implores him to not tell anyone, like ever. Then when she arrives in Vermont, Margaret Whitcomb (Wendie Malick) thanks her for not telling anyone, like ever, and now what’s a girl supposed to do? Well, since this is the Hallmark Movies and Mysteries Channel, there is a bit of mystery in the movie. Miranda starts receiving texts and calls from an unknown number indicating that someone out there knows about her father. Not cool, Josh! She told you to shut it. But is it Josh? Miranda trusts him completely, so if it’s not the ex and she didn’t tell anyone else, who could it be? This hangs over her and casts a shadow over an otherwise great holiday. It’s as if she has to make up for all her lost Christmases and is living it up by attending every party she can. She also wants to go the extra mile with decorating, even though she’s only in town for a short visit. The boyfriend is the best part of the vacation though. Ian’s good for her, but he’s also a treat for us. I love watching the two fall more in love, and Krakow and Matter make the romance look so natural and easy. If you binge on romcoms and Hallmark movies, it’s a nice change of pace to journey with a couple from the halfway point rather than from the beginning (though you can do that too). This is how good sequels happen. Engaging Father Christmas is not a rehash of the original even if it picks up on some of the same themes of family and belonging. There’s something comforting about sticking by familiar characters but also something exciting about striking out in a new direction. This movie differs in story and tone. It’s certainly merrier than the first one, but that’s countered with a touch of intrigue that keeps things from growing too sentimental. Word is a third installment could be coming. I hope Miranda and Ian will have a mini-me by then and expect the movie to be called Raising Father Christmas. Posted in USA, Western TV reviews and tagged Christmas movies, Hallmark Channel, TV movie on December 3, 2017 by limmer13.